What Are The Best Electric Golf Cart Models? Electric golf carts are a great option for people who don’t want to carry their golf bag but use that energy on the field instead. They provide a much more comfortable golfing experience, which is why you should consider buying one if you’re an avid golfer. Today, we’re going to talk about 4 of the best electric golf cart models money can buy, based on their price and the features they offer. We’ll tell you all about their specs, what makes them stand out, and how much they cost. You may be asking, “What is the best electric golf trolley or best electric golf push cart available on the market?” Let our best electric golf cart reviews serve as your guide in choosing the right one for you. The Bat-Caddy X3 is the most affordable best electric golf cart model on today’s list, and it is available on Amazon. The price makes it one of the most popular choices, but this is not the only thing that appeals to customers. We’d also like to mention the time advance function as a very interesting feature. This function makes the cart advance in front of the golf player, preventing any injuries. The Bat-Caddy X3 has a single 200-watt electric motor, stainless steel components, and an aluminum alloy frame. You control it with a remote, at a distance of up to 120 yards. However, keep in mind that for the most accurate results, you should keep it at a distance of about 20 yards. This electric golf cart is easy to control left, right, forward, and reverse, and it also comes with a retractable rear stabilizer wheel to balance the one front wheel and two rear ones. The battery takes between 4 and 8 hours to charge and it has an approximate lifetime of more than 150 charges. Other special features of the Bat-Caddy X3 are its USB port, battery charge indicator, cruise control, and manual rheostat control. In terms of the best electric golf carts, this one is Cart Tek’s most popular option, and with good reason. It has two 180-watt motors and a battery of 40 Ah. This makes its range longer than others’, more precisely somewhere around 36 holes. Of course, this also depends on the course and how it is structured. One thing we must mention about it is that you can adjust the speed setting on the remote, as far away from the cart as 100 yards. Moreover, for the people who aren’t scared of a bit of rain when they play golf, this Cart Tek electric golf cart is one of the best options on the market. Why? Because it has waterproof housing. This ensures the electronics won’t get damaged. For your convenience, the cart also comes with holders for your scorecards, umbrella, drink, and balls. You can load it with up to 65 pounds. Its current price can be found on Motogolf.com. Moving on to slightly more expensive electric golf carts, the Motocaddy M3 PRO (Check the current price on Onlinegolf) is definitely one of the best and most user-oriented electric golf carts on the market. It has a frame made of two bars, which is extremely comfortable to hold on to, yet also makes the cart more compact. You can actually fold it in such a way so as to turn it into an airplane hand luggage. Some of its most interesting features are a full-color digital screen, a “round” timer, a “lost ball” timer which is particularly useful, a battery meter, and a clock. Since safety is also important to a lot of people, this M3 PRO model has a CartLock security feature where you can insert a pin code. Without the pin code, the cart becomes useless. If this is not enough to convince you to give this cart a shot, maybe the Adjustable Distance Control system that you can use to set the cart to travel independently will. For the people who will only settle for the very best on the golf course, the Bag Boy Navigator Elite is a dream come true. This high-end golf cart will revolutionize the way you think about electronic golf carts. 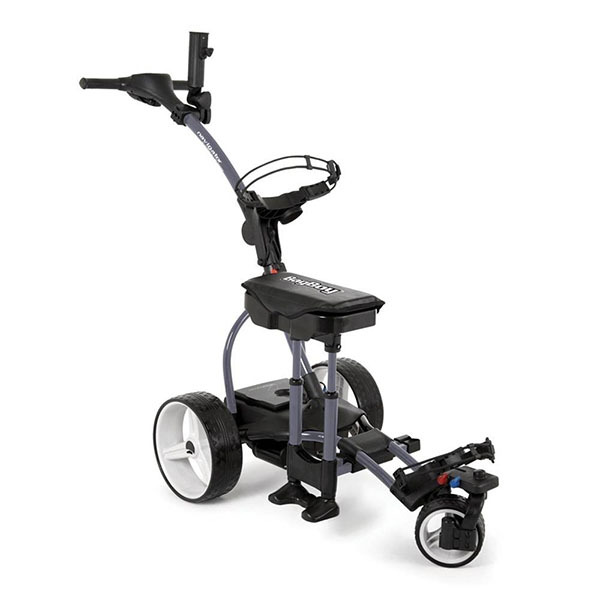 With a full directional remote that includes left, right, forward, reverse, and speed controls, a color interactive screen, a 24-volt battery, a padded seat that doubles as a storage compartment, and many other amazing features, this cart will definitely improve your golfing experience. We must also mention the 360-degree swiveling front wheel that comes with suspensions, the twin 200-watt motors, and the cart’s compactness. You can also ask for additional features like an adjustable handle and different types of holders when you order it. The Bag Boy Navigator Elite price can be found on Golfdiscount.com. Putting your clubs in an electric golf cart is more convenient and will save you time and energy. Not only will it prevent back strain, but it will also allow you to focus on playing golf. Gone are the days when players have to carry their clubs with them around the golf course. An electric golf push carts/trolley is indeed very helpful as it eliminates the need to carry those heavy things. It is sturdy, lightweight, and easy to use. But for you to have the best electric golf push cart, you should consider adding accessories to add convenience and functionality. Protect yourself from harmful ultraviolet light with the help of a UV umbrella. It provides maximum protection from the elements, rain or shine. This accessory won’t be putting too much load on your golf cart as it weighs just over a pound. A golf bag is a must-have for all golfers. It separates your iron blades to prevent them from clapping together. As far as design goes, a golf bag has slots for nine irons, driver, fairway woods, rescue clubs, and putter tube. Moreover, it has plenty of pouches for belongings, valuables, pencil and tee holders, glove holder and so much more. Rock the golf course with your favorite tunes by adding a Bluetooth speaker to your golf cart. Some even have a built-in mobile power bank for charging your mobile phone. This holder can accommodate mobile phones, MP3 players, and GPS devices. Folding arms and side cushions help keep your devices in place. Keep your lithium battery conveniently located and protected with the help of a battery basket. This golf cart accessory comes with mounting hardware and bungee to lock your battery in place. This accessory is mounted on a golf cart and can hold cans and water bottles, allowing you to re-hydrate whenever needed. The storage seat comes with a mounting bracket that is affixed to the cart frame. It has space for golf balls, snacks, among others. It is important to note that the bracket doesn’t interfere with the way the cart folds. A perfect upgrade for any golf cart trolley, this accessory holds your scorecard, golf balls, tees, and pencil. It comes with screws that match with mounting ports on any electric golf trolley. Use this to hide your battery inside a golf bag pouch. Removing it from the battery tray affords room for a cooler basket or a ball and club cleaner. Travel or carry bags are handy for storing your electric golf trolley neatly in the back of your SUV or inside the trunk. No matter how much you’re willing to pay for an electric golf cart, you can find plenty of options on the market to suit your needs. Don’t hesitate to try out your favorite among the 4 electric golf carts we’ve reviewed today, and let us know what you think. We would also like to hear from you if you’ve already had experiences with some of these carts.